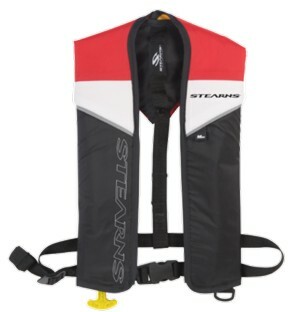 Stearns’ inflatable adult PFDs are made for angling, canoeing, sailing and paddle sports where comfort and safety are paramount. Available in manual or auto/manual configurations, these low-profile vests are lightweight, breathable and Transport Canada approved. Re-arming is easy with a Stearns re-arming kit. Featuring a two-inch adjustable belt and universal sizing, Stearns PFDs are flexible enough to go over a tee-shirt when the days are hot or for use over jackets and coats in cooler weather. All Stearns inflatable PFDs include a mesh storage bag for fast drying and carrying convenience.